I LOVE blueberry pancakes. I love them even more if they are low in saturated fat. How do I make them low in saturated fat? I avoid butter and use Original Silk Soy Milk. 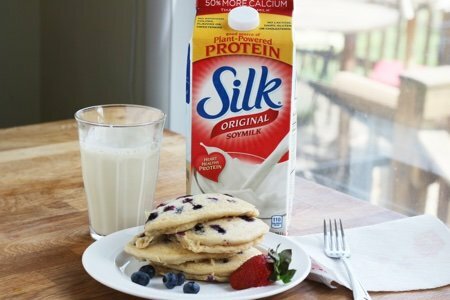 Silk soymilk is an excellent dairy-free source of protein. It is made from plants, it tastes delicious and it is naturally low in saturated fat. This recipe is super easy. All you have to do is remember the number ONE. One cup flour, one tablespoon sugar, one tablespoon baking powder, one cup soy milk, and one small package blueberries (plus ¼ teaspoon salt). When they heat up the blueberries burst rendering them incredibly delicious. This is not a recipe for frozen blueberries. These pancakes have protein and fiber that keep me filled up until lunch. Visit the Silk Soy Website to get a coupon for Silk Soy milk. You can find Silk Soy Milk here: Where to Buy. Mix flour, sugar, and baking powder in a medium sized bowl. Whisk in soy milk until smooth. Fold in blueberries. Coat a large non-stick pan with cooking spray and heat over medium heat. Ladle ¼ cup of batter on pan and cook 3-4 minutes per side until the pancake is cooked through. I'm on a strict diet and I want to stick to my recommended calorie intake for the whole day. I will have to try soy milk in my pancakes. Thanks.